While it’s always fun to eat fancy and frou-frou, sometimes it’s great to get back to the basics. 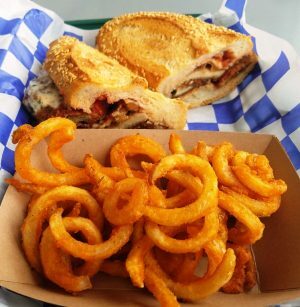 And the basics is what you’ll get at a little eatery named Steve’s Place in Raleigh. 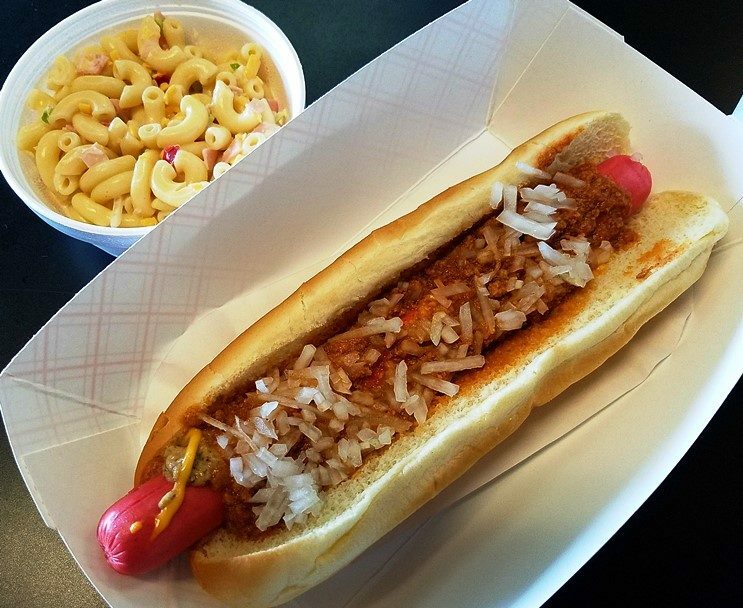 I had run into several 5-star reviews for Steve’s Place online and talk about its hot dogs. 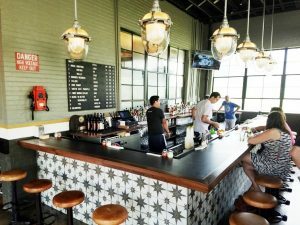 So I couldn’t resist stopping in as I was heading north on Capital Boulevard for a quick lunch and bite. Steve’s Place sits in the busy little Plantation Square plaza along with Baker’s Dozen Donuts 2 (ooooh). I circled the small parking lot a bit before spying the green and white Hot Dogs sign overhead and a “Steves” neon sign below, success! Inside, Steve’s Place is pretty basic and bare-bones. 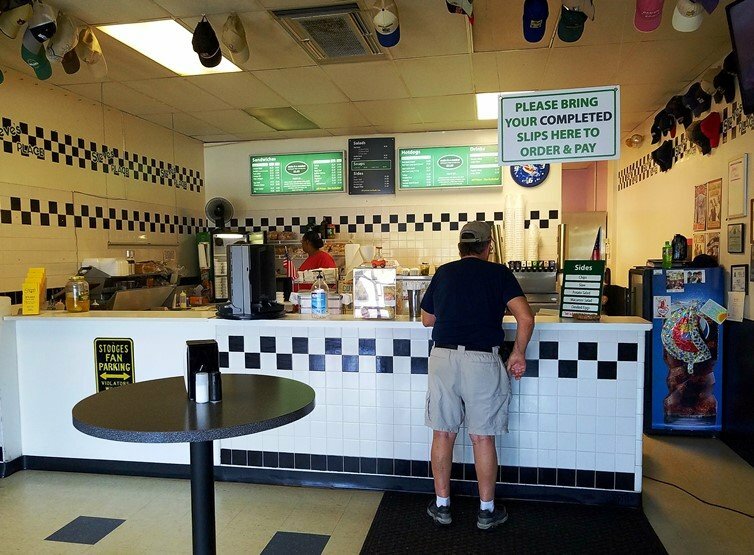 It has a deli-like feel with green and white tiles, some stand-up high-boy tables along with a order form counter to the left. 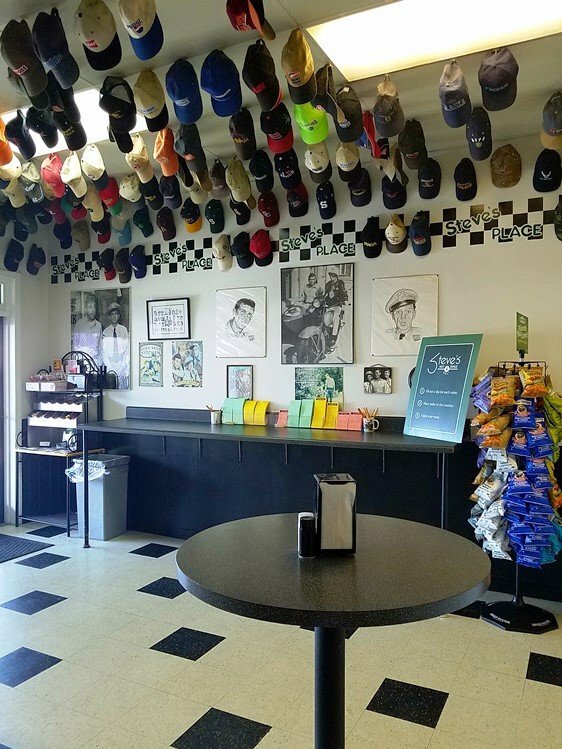 And I look overhead, the ceiling is covered with baseball caps, cool! I’m on a bit of a schedule today so thankfully, the Steve’s Place menu is small and simple: deli sandwiches, hot dogs, soups and salads. But I’ve got hot dogs on the brain, today! At the order form area, you’ll find some brightly colored slips of paper where you can customize your order. For hot dogs, Steve’s Place offers up a beef hot dog, red (pork-beef), turkey, smoked beef, kielbasa and sausage. I’m going for a classic foot-long red with mustard, chili, onions and cheese. 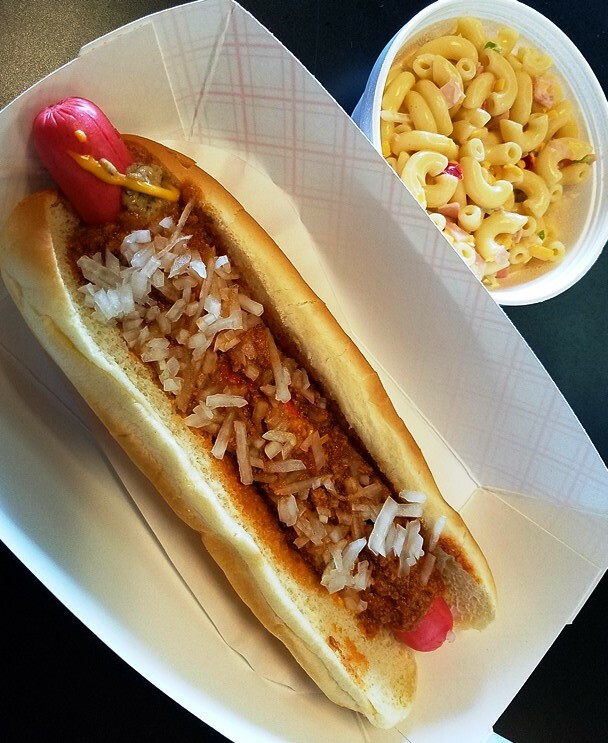 Pretty much a North Carolina hot dog standard along with some macaroni salad as the side. You can choose from chips, slaw, potato salad and deviled eggs as a side in addition to that macaroni salad. My food takes 5 or 10 minutes to come out so I know it’s being cooked to order. My name is called out and I’m handed over a cup of macaroni salad and my long, hot dog! It all looks pretty tasty and fresh, I dig into the macaroni salad which is wonderful. Served cold with tender elbows, chopped red onions and peppers, the light sweet dressing is perfect on this very hot day. And the hot dog is excellent as these hot dogs go. Plenty of chopped white onions, rich chili and the tang of mustard. The bun is lightly toasted, it’s a good hot dog here at Steve’s Place. So in about 30 minutes I’m in, fueled up and out the door which is what Steve’s Place is about. 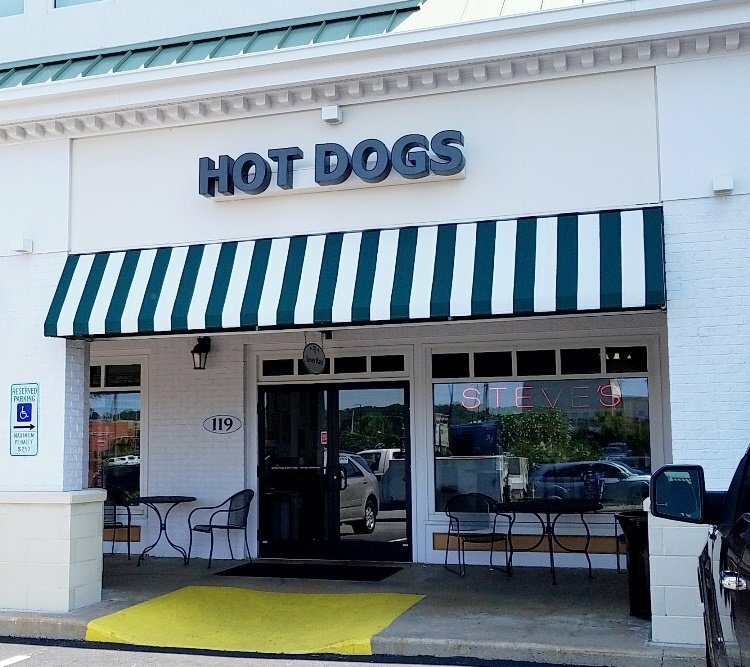 A casual, quick-stop for lunch offering up some fresh sandwiches, salads and hot dogs with some classic Southern flavors. And sometimes that’s exactly what you need for lunch, thanks Steve!